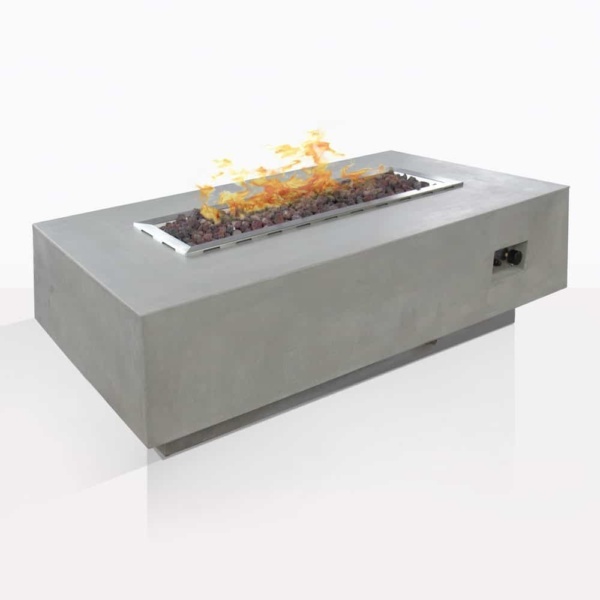 Enjoy outdoor living even when the temperatures drop with our incredible Concrete Rectangle Fire Pit. It’s impressive and luxurious and will add a contemporary and polished look to any space. Create a deep seating sectional sofa that surrounds the fire pit so that guests can gather around and enjoy the warmth and ambiance. Lava rocks and a stainless steel pan sit in the center and when the unit is turned on it provides ample heat to near by areas. The Fire Pit uses natural gas and it is equipped to either attach to your gas permanently, or hook up to a refillable propane tank. If you choose to connect it to your gas line you must contact a professional gas fitter to help you install it. Adding a fire pit to your outdoor space ensures that you will enjoy it more often, and what is better than that! We offer several outdoor accessories, please enjoy browsing our website, or visit our showroom in person to check out these fabulous heaters.